In an effort to innovate the way we approach health and safety on Project 622 at John Radcliffe Hospital, we have created a way to make sure that work never begins on an unsafe site. 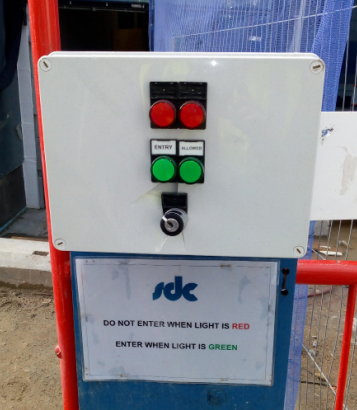 Using the Access Light System and the access gate to the live site area, in the morning before work has begun, the site is set to red, meaning no one can access the work environment until a safety walk around has been undertaken. The light remains red until any and all safety issues raised on the walk around have been addressed. Once the all clear has been given, the light is switched to green and work can commence. After five hours (coinciding with a work break) the light automatically reverts to red. At this point, another safety walk around takes place, followed by (if necessary) the remediation of any issues, at which point the light is switched to green and work can once again commence. We believe that this creates a safer site for all of our workers, as issues can be addressed before the general workforce access the site. Monitor Report. SDC Builders Ltd. Oxfordshire. March 2019.